This module will help you understand how to utilize the search bar, and conduct an advanced search to fetch any record of your choice. Navigate to the search bar on top. Click the drop-down menu on the search bar. Select a module(items, contacts, etc.) from the list to search from. By default, the system will already have the module selected based on the page your are in. you can change if you want to. 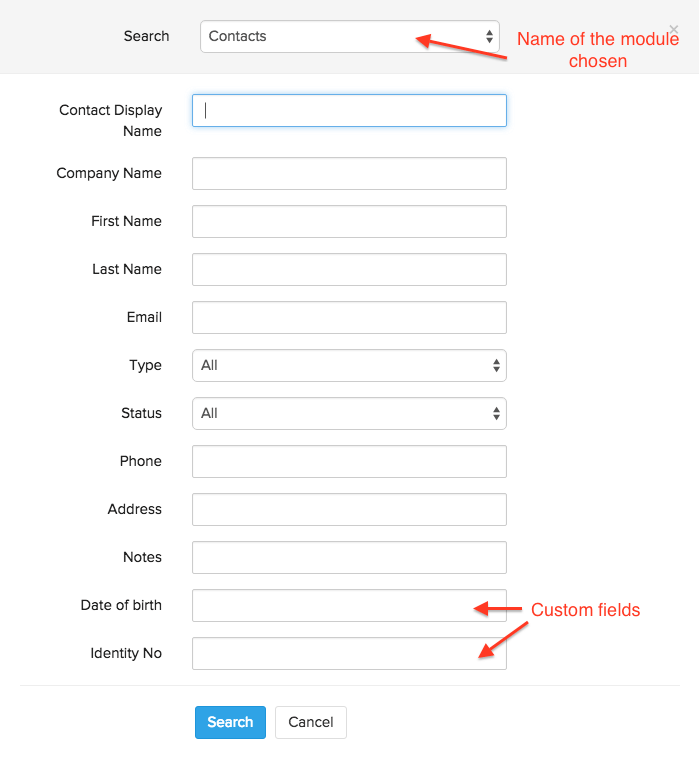 After selecting the module, type the name, description or any field information precisely. The search mechanism will swiftly compare your input with the records and fetch those related to it. Click on the Advanced Search option. An advanced search pop-up will open up. If you have added any custom fields for that module under settings, they will also be displayed. Once you are done, click on the Search button. The data you entered across the fields will be mapped and the system will fetch the record(s) you are looking for.